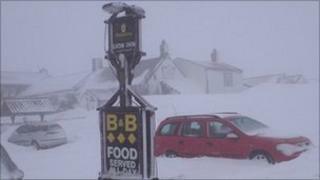 A couple and five staff spent eight days trapped inside one of Britain's highest pubs because of heavy snow. The Lion Inn at Blakey Ridge, near Kirkbymoorside, North Yorkshire, was cut off since Friday last week, as 20ft (6.1m) of snow drifted against the pub. The couple, from Darlington, were trapped until a plough made its way over the North York Moors and they followed it back to the nearest town. The staff remained until the road was officially opened on Saturday night. The Lion Inn is also a bed and breakfast and during their eight days inside the pub the couple and staff were able to stay in its bedrooms. Speaking before the pub reopened, chef Daniel Butterworth admitted he had been talking to himself during the enforced lock-in. At first the staff, all aged under 25, got stuck into the drinks, he said, but on the third day they eased off. "We haven't been getting ratty," he said. "It's been fun and we have had a laugh. "We have been getting on with little jobs, having our tea, a drink, playing games and then going to bed. "The bosses aren't here, they are snowed out. "We have wireless internet here and the television works so we have been fine." During the day, the couple and staff managed to get out onto the snow on improvised sledges made from beer trays. The beer did not run out and there was plenty of food at the inn, which stands 1,325ft (404m) above sea level. Mr Butterworth admitted the icy internment had not been all fun. "I have been going a bit crazy, doing weird things like talking to myself," he said on Saturday. "Hopefully, we will get some more customers in when the road opens again. I could do with some more company. "We have had people phoning up asking to get trapped in, but it's kind of boring now and I would like to go home."